The Festival of Middle Eastern Culture took place on Thursday, Nov. 15 and was part of International Education Week. May Mahrat, who earned her Master of Arts degree in Cultural Analysis and Social Theory in October 2017, and Mary Saleh, a Master of Arts student in English and Film Studies, wrote about the festival. 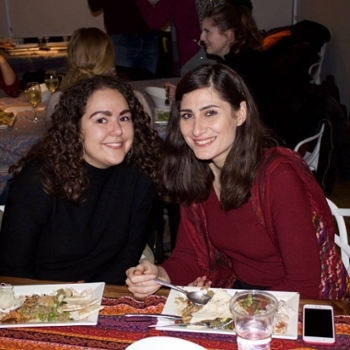 On Thursday, Nov. 15, International Students Overcoming War (ISOW), with the support of the Global Engagement Fund for WLUSU and WLUGSA clubs, organized the ISOW Middle Eastern Cultural Evening at Veritas Cafe, on the Waterloo campus. The evening was planned by a group of ISOW leaders, as well as ISOW scholars coming from different parts of the Middle East. During the two-hour celebration, more than 150 people gathered to participate and learn about Middle Eastern culture. The evening featured various aspects of Middle Eastern culture presented through food, photography, music, signing, dance and art. The evening started with a Middle Eastern buffet. Cooking was planned and prepared at Veritas by Meg Brockett, an Master of Social Work student at Laurier, and Bushra Ahmad, a Syrian lady and talented cook who has participated in other Laurier events with her great dishes. Former and current ISOW student leaders and scholars also assisted with the cooking. Dishes included makloubeh, fatteh, mufarrakeh, harraq be esbao, lentil soup and other delicious specialities. The Middle Eastern cuisine is notable for its rich variety of dishes that are usually very sophisticated and are prepared in large quantities, always gathering people in kitchens and around tables. Atmospheres around Middle Eastern cooking always reflect the culture’s collectivity and appreciation of teamwork. The evening also featured photographs taken by ISOW scholars. They were displayed at Veritas in a photo gallery that took the viewer through a journey across streets, nature, traditional restaurants, warm houses and traditional customs, demonstrating with the cultures, geographies and architectures of the places ISOW Scholars come from. After the first hour, the evening moved to the Senate and Board Chambers where the performances took place. Manar, an ISOW scholar from Syria who is pursuing a bachelor’s degree in Physics at Laurier, played the oud, a short-necked stringed instrument, with Lebanese singer Omar Abdul Samad. Manar played different pieces of Middle Eastern music before Omar joined her and sang the mawwāl, a traditional genre of vocal music, and other Arabic songs. They both finished with a singing activity with the audience, allowing everyone to sing in Arabic and experience the sounds of the language on their tongues. The Levant Dabke Group ended the evening with an amazing dabke dance performance. Performing three dances, hand-in-hand and stomping the ground with great energy and enthusiasm, the group presented one of the culture’s most admired traditions performed at various occasions like weddings and national celebrations. As they always do with their audience, the Levant Group invited everyone to hold hands with them and do a dabke dance. Along with the musical and dance performances, attendees enjoyed having henna art tattooed on their arms by skillful Syrian newcomer youth. They also had favourite words, expressions, or names written in Arabic on rocks, embellished with artistic Oriental patterns, to have as souvenirs of the event. This event represented a space for international students to showcase their culture, and a chance for other students to experience it, bringing people together in a multicultural setting at Wilfrid Laurier University.